Oh this should clear everything up. Ryan Braun tests positive and gets off because his sample was contaminated, damaged, left outside in the rain, microwaved and mixed with Mountain Dew. Baseball and Braun went to arbitration and Ryan Braun became the first person to beat the rap. So yeah, we need to go forward legally giving Ryan Braun the benefit of the doubt. I guess so, if the reaction to Jeff Bagwell speculation is any indication. 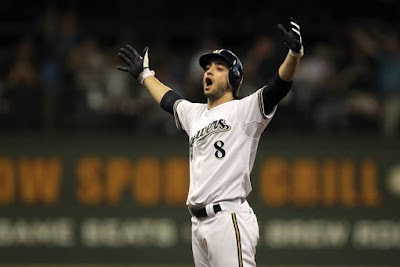 Did Ryan Braun take something or did MLB mess up his sample? May I suggest tightly securing lids from now on, MLB? I don't know if Braun did anything or not. But the way I see it, MLB made a mess of this whole situation. The case never should have been public. The resolution never should have taken several months to play out. The sample never should have been handled as poorly. If MLB did their job properly, there would be nothing to discuss unless he was proven guilty. Now he will forever be linked to steroids. This is a very good deal. Thanks, I enjoyed.